Myoepithelioma of the breast is very rare, mostly benign tumor which usually contains two different kinds of neoplastic cell growth. It contains a certain amount of myoepithelial cells in a ‘spindle shape‘, in addition to clusters of neoplastic epithelial cells. However, certain histological features of this condition are indicative of a serious, malignant situation, which is termed malignant myoepithelioma (MM). Benign myoepithelioma is rare, however, and malignant myoepithelioma is rarer still. Breast myoepithelioma can develop in women from their early 20’s right up to their 80’s, but it is most common in women over 50. This page is a little bit outdated, but still very useful. However, I have created a brand new, more up-to-date page with even more information on Myoepithelioma. In the normal ductal and lobular system of the breast, two cells types, epithelial and myoepithelial, are found in the linings. The epithelial cell layer, which is right next to the open space or lumen of the duct, largely has a secretory function. The myoepithelial cells are further back, away from the lumen and attached to the basement membrane. Myoepithelial cells have genetic similarities to smooth muscle cells, and give the duct lining strength. 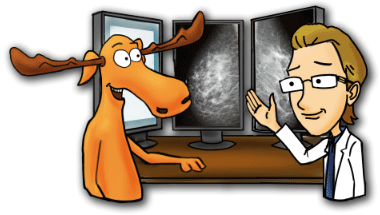 Breast myoepitheliomas are usually discovered as a painless, palpable nodule. If a mammogram is taken, they will usually appear ‘suspicious for malignancy‘, due to asymmetric density and the lack of really distinctive features. The benign version of this type of breast tumor will always show a dual cell population featuring clusters both of epithelial cells, and the spindle-shaped myoepithelial cells. Cells tend not so show any necrosis or mitoses. There may be mild to moderate nuclear pleomorphism (variety of odd shapes), but most have regular, oval nuclei. The background cytoplasm is usually clear, sometimes will contain the occasional intranuclear cytoplasmic vacuole, and a fibrillary, metachromatic, myxoid material. (Metachromatic means the background substance will stain differently with the same dye, indicating a wide variety of proteins). One typically finds interlacing groups of cells, which may present in solid ‘sheets‘ or masses, or may be stellate (star shaped). Malignant myoepitheliomas will show distinctly atypical nuclei, particularly within the myoepithelial cell component. Cell mitosis is very common, within a metachromatic background substance. On immunohistochemistry, the cells will tend to stain positive for smooth muscle actin, keratin MNF 116, and vimentin, but negative for desmin and S-100. Malignant myoepitheliomas will often be found partially infiltrating the surrounding fat tissues, or completely surrounding breast ducts. The main difference between a malignant myoepithelioma and metaplastic breast carcinomas is that the mesenchymal component in metaplastic carcinomas will also express epithelial markers, while a myoepithelioma will not. There is also an emerging idea that malignant myoepithelioma of the breast might actually be a variation of monophasic sarcomatoid carcinoma, as they have very similar clinical and morphological characteristics. Most myoepithelial breast tumors are generally thought to be either benign or low-grade lesions, and metastasis is very rare. However, all these types of breast tumors should probably be managed as potentially malignant tumors. Malignant myoepithelioma of the breast, although very rare, can be an aggressive disease with a poor prognosis. Oh Oh, that’s bad news, about poor prognosis with the malignant type. A majority of patients who develop malignant myoepithelioma will experience distant metastatic spreading of the disease, and will likely succumb. So, all these types of tumors are therefore treated aggressively with wide surgical excision and very close follow-up. Radiation therapy might be as useful adjuvant treatment, but the post-operative delay before beginning treatment should be minimized, and higher-than normal doses of radiation considered. These tumors have been shown to be somewhat resistant to radiation. What is malignant myoepithelioma? It’s a lump. What more do you you want? Would you prefer a trip to Disneyland or some histology and cytology and histopathology and immunohistochemistry? I thought so. I must be tired though, because all I can tell you is in the upper part of this page. Sugano I, Nagao T, Tajima Y, Ishida Y, Nagao K, Ooeda Y, Takahashi T: Malignant adenomyoepithelioma of the breast: a non-tubular and matrix-producing variant. Pathol International 2001, 51:193-199. Thorner PS, Kahn HJ, Baumal R, Lee K, Moffatt W. Malignant myoepithelioma of the breast. An immunohistochemical study by light and electron microscopy. Cancer. 1986 Feb 15;57(4):745–750. Damiani S, Riccioni L, Pasquinelli G, et al. Poorly differentiated myoepithelial cell rich carcinoma of the breast. Histopathology 1997;30:542–8. Back to Types of Lesions list or to the new homepage.